C. F. Martin 00-28 Model Flat Top Acoustic Guitar (1926), made in Nazareth, PA, natural lacquer finish, Brazilian rosewood back and sides, spruce top; mahogany neck with ebony fingerboard, black hard shell case. Well-played and well-loved, with good reason. This is a truly wonderful-playing and sounding 12-fret 00-28. Original engraved Waverly tuners with ivoroid buttons, bar frets, and slotted diamond fingerboard inlay. 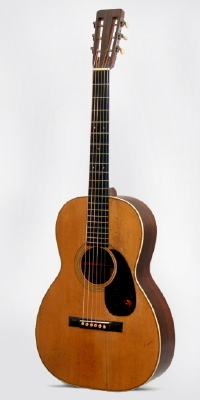 Pickguard is the correct Martin pattern in old tortoise celluloid and was likely added not long after the instrument's completion; many Martins were retrofitted with guards in the 1930's. Bridge is original ebony, pyramid-style, slightly flattened on top, with original grained ivoroid bridgepins. Beautifully grained Brazilian rosewood back, Herringbone top inlay with wood, and celluloid soundhole rings. Truly a heavenly-sounding guitar, a classic example of the earliest steel-string Martins. Overall length is 38 3/8 in. (97.5 cm. ), 14 1/4 in. (36.2 cm.) wide at lower bout, and 4 in. (10.2 cm.) in depth at side, taken at the end block. Scale length is 24 3/4 in. (629 mm.). Width of nut is 1 13/16 in. (46 mm.). Overall a very attractive guitar, but with numerous signs of use. Four long top cracks behind the bridge; mostly cleanly repaired except one with a noticeably darker splice. Typical pickguard crack and one smaller edge split repaired solidly but visibly. Brazilian back and sides very well-preserved with one back crack off the center seam and one very small waist crack on the bass side. A lot of general finish wear, but only small areas of French polish touch up around repairs. Plays and sounds excellent. Very Good + Condition.